Day 162: California Dreaming . . . Watching the Weather Channel and seeing reports of Winter Storm Nemo leaving its’ mark in the northeast to the tune of 25-40 inches of snow in a variety of locations – in fact, Daughter #2 sent photos of 20 plus inches of snow near Boston. Wow, we have to go back a lot of years to remember that kind of snow. Brian was talking with his mom today and she reminded him of the 26 inches of snow that fell in their suburban Chicago neighborhood back in January of 1967. C’mon man, to be 86 years old and recall a snow storm like that over 45 years ago? Awesome!! Yep, we were just little tykes back then and the only thing Brian remembered about that snow storm was that the milk man had to deliver the whole block’s worth of milk at our house (because we were the first one on the block) and the other families had to come and get their milk. Now, clearly we have once again dated ourselves – yes, we actually had milk delivered to the house back in the mid-60’s. And, when it was fall and winter in the Chicago area, that milk was the coldest and best tasting you’ve ever had! In the spring and summer, the key was to get the milk out of the milk box just AFTER it had been delivered. Jean, on the other hand, had to get the milk in fast because in California, it was never WINTER! Times sure have changed. We endured a similar snow storm (as previously blogged about) back in 1990 while living in St. Peters, Missouri . . . and we had a couple of light “dustings” of snow in Kerrville shortly after moving there. In fact, it was this exact weekend back in 2004, that Interstate 10 was closed from Junction to San Antonio because of ice and snow. Now, if you’ve never driven this Interstate before, you need to know that it has a LOT of hills and valleys, so when TxDOT closes an Interstate, it’s for good reason. Can you imagine an 18-wheeler or two coming down an icy road? NOT pretty! Yep, weather like that, and our gloomy day today here in SM, set us up for dreaming of warm, sunny days fishing in the bay. Throwing a line out to catch a redfish or trout . 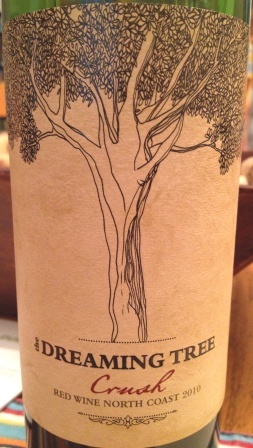 . . and it’s that exact kind of dreaming that leads us to our wine of choice today – a 2010 Dreaming Tree Crush. Now, those of you who are faithful followers of Casa del Vino, know that we previously tasted and wrote about Dreaming Tree, but today’s wine is their Crush varietal. If ever there was a perfect wine for a lazy Saturday, we’ve found it in Dreaming Tree Crush. The nose is smoky with a strong sense of berries. We actually spent a lot of time enjoying the nose of this wine–for a young blend it was remarkably balanced. The taste was smooth, silky – full of berries and oak. It’s a perfect wine for enjoying on a gray Saturday or sunny Sunday (or any other day for that matter!) And, because we love blends, we absolutely rave about this one. . .at 78% Merlot, 13% Syrah, 6% Zinfandel, 2% Petite Sirah, 1% Malbec, 1% Cabernet Sauvignon, you’ll be amazed at the fruit, the oak, the earth and for such a young wine. Dave Matthews and Steve Reeder have shown once again that good wine can be made from a variety of sources to produce a delicious product. The finish on this wine is long and smooth. It has a terrific raspberry taste that keeps going and going. We really like that! Priced around $12 a bottle, you’d be hard pressed to find a nicer blend for less. If you’re planning on an afternoon on the deck, then Crush is a great choice. If you’re planning on grilling some salmon, then open a bottle of Crush. We’re glad that we aren’t dealing with the snow or ice. Having gone through these stages of life previously, we completely love the fact that we’re in Texas!! We’ll take 65 degrees and misty outside versus 20 degrees and blowing snow like Daughter #2 is dealing with up in Massachusetts. Regardless of your weather, break out a bottle of your favorite wine and enjoy it responsibly . . . when you’re done, remember to recycle the bottle! Categories: Uncategorized | Tags: california, Chicago, Crush by Dreaming Tree, Dave Matthews, Dreaming Tree Wines, Milk, North Coast Red Wine, Steve Reeder, Winter Storm Nemo | Permalink.